With more than four decades of drum building experience, Tama knows what it takes to make a great drum set. Imperialstar originally debuted years ago when Tama first set out to create the ultimate, affordable, all-in-one drum set. Since then, Imperialstar has established itself as an undisputed industry standard, always evolving and improving to meet the changing needs of drummers. 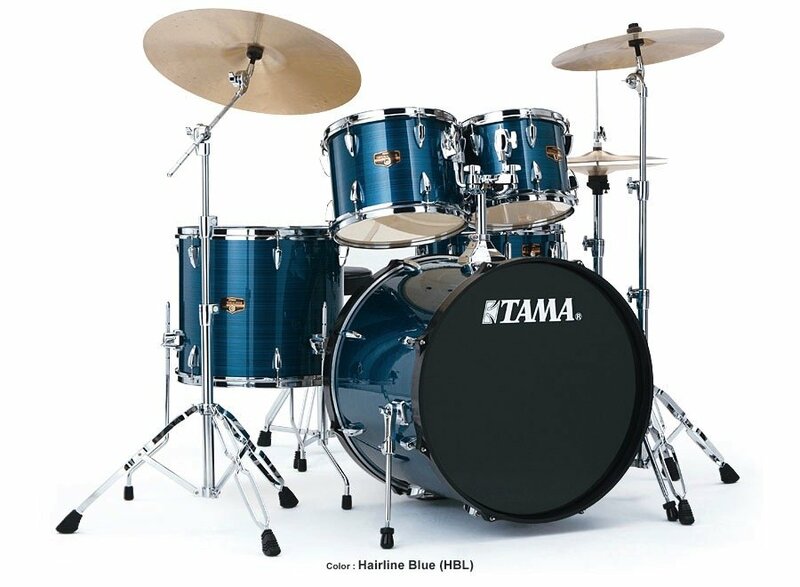 Today's Imperialstar stands as a hallmark of Tama's devotion to quality, innovation, and durability. Regardless of how advanced or new you may be as a drummer, Imperialstar is the smartest and most economical way to make your voice heard, on stage or in the studio. Shell Material Imperialstar drums shells are 7.5 millimeter-thick and made using 8 plies of 100% Poplar. Poplar has been a choice wood used in building drum shells for over 50 years and offers full, warm tone and medium attack. TAMA Precision Bearing Edges The bearing edge is one of the most important components in achieving a good drum sound. Our advanced edge-cutting process produces clean, precise bearing edges that allow TAMA shells to ring fully and more openly. It also provides a wider range of tuning, along with greater sensitivity and sharper response. 100% Glued Wrapped Finish Some drum makers only affix their wraps by taping the finishing sheet to the shell at "selected contact points." All of Tama's wrapped finishes are 100% glued to eliminate warping, buzzing, or lifting. This method is more expensive and more labor intensive, but allows the shell to resonate, fully and consistently. Accu-Tune Bass Drum Hoops Imperialstar bass drum hoops utilize a specially formulated hi-tech material that offers lighter weight and faster, more stable tuning. Because Accu-Tune hoops use tension bolts instead of claw-hooks and T-rods, head changes and packing up are a breeze. Acclaimed Tama Omnisphere Tom Holder System TAMA Omnisphere tom holder systems have received numerous accolades from drummers for over 25 years and are acclaimed for fast, flexible positioning coupled with rock solid stability. This version follows Tama's original design principle, which prohibits any external shell intrusion that might inhibit the shell's natural resonance. Iron Cobra 200 Pedal The Iron Cobra 200 series was developed around the same design principles as Tama's renowned Iron Cobra 900 series, and offers remarkable performance and durability. The 200's Power Glide cam provides a smooth, light feel without sacrificing power or speed. Both the HP200P and HP200PTW can be fitted with TAMA's Cobra Coil for an even faster footboard return. STAGE MASTER Hardware Stands Imperialstar hardware derives many of its advanced features from our high-end "Roadpro" hardware series. Stagemaster stands offer solid stability, easy operation, and unparalleled Tama durability. MEINL HCS Cymbals Rounding out Imperialstar's impressive array of features, Tama has chosen to partner with Meinl? Cymbals, the choice of today's new generation of drummers, to include Meinl's HCS cymbals. These great sounding, genuine brass cymbals are the ideal counterpart to Imperialstar's powerful, sonorous drums.